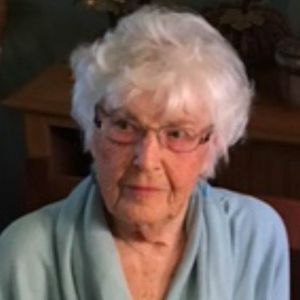 Constance "Connie" M. Schultz, 96, of Fond du Lac, passed away on Monday, March 25, 2019 at the Crossroads Care Center in Mayville. A memorial gathering will be held on Sunday, April 7th from 1 p.m. until the time of the memorial service at 2 p.m. at the Immanual-Trinity Lutheran Church in Fond du Lac with Rev. Sue Sheffer-Meyer officiating. (20 Wisconsin American Dr, Fond du Lac, WI 54937) Inurnment will take place at Rienzi Cemetery in Fond du Lac. Constance Marie was born the daughter of Bernard and Irene (Firehammer) Scherschel on May 6, 1922 in Horicon, Wisconsin. She was a graduate of Fond du Lac High School. On September 13, 1941 she was united in marriage with Gordon A. Schultz. Connie was a member of Immanuel-Trinity Lutheran Church in Fond du Lac. She enjoyed cooking and baking, and liked to crochet and knit. Family was most important in Connie's life. She is survived by her son-in-law; George Olson of Mayville, grandchildren; Brian (Michelle) Olson of Mayville, Steven (Karrie) Olson of Mayville, Carolyn (Andrew) Redington of Berlin, great-grandchildren; Molly and Garrett Olson, Addison and Paige Olson, Landon and Hayden Redington. She is further survived by other relatives and friends. Connie was preceded in death by her parents, her husband Gordon in 2012, two daughters; Lynn Fisher in 2014 and Faye Olson in 2016, brother; Bernie and her sister; Virginia. Memorials may be directed to Immanuel-Trinity Lutheran Church, Church Building Fund in Fond du Lac. Add your thoughts, prayers or a condolence to Constance's guestbook.